Clarity is proud to be the first manufacturer of amplified telephones that meet strict new compliance standards for amplified telephone sound quality established by the Telecommunications Industry Association (TIA). The TIA-4953 standard for amplified telephones establishes the first official industry benchmarks for telephones designed for individuals with hearing loss. The purpose of TIA-4953 is to provide consumers with hearing loss with objective information to verify how a specific telephone model will help them to communicate on the telephone. TIA-4953 tests performance metrics in hearing loss categories of mild, moderate and severe. The standard requires laboratory-based testing, using specialized telephone test equipment, to measure sound amplification (volume control gain), tone control, simulated use for hearing aid users, and the sound level of the ringer. The telephone sound output must meet stringent noise and distortion requirements even for the highly amplified settings. "These new requirements are critically important for improving telephone conversations for the millions in need in the hearing loss community," said Carsten Trads, president of Clarity. "People with hearing loss can be confident that telephones that have passed the requirements in the new TIA standard will really help them to hear and understand speech better. Clarity is proud to be the first and lead our industry forward to meet these new standards." 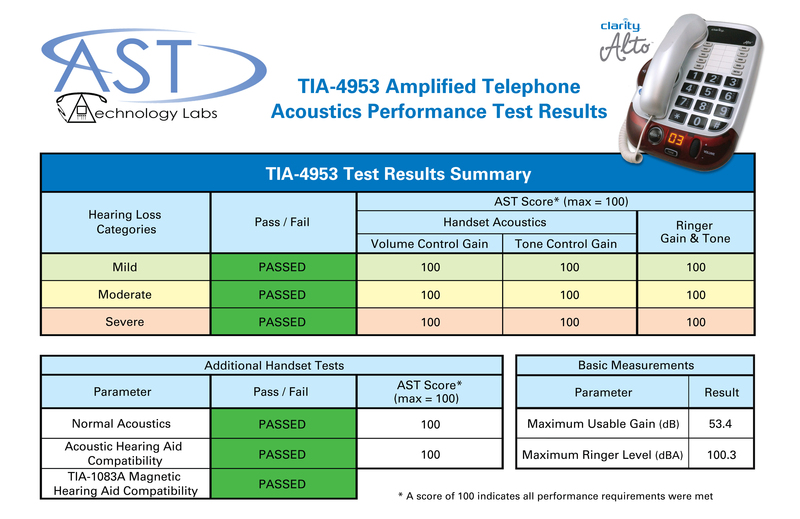 AST Technology Labs, an independent telephone test lab which performs testing for TIA standards, verified that Clarity's Alto meets the TIA-4953 requirements for telephones for individuals with mild, moderate, or severe hearing loss. "The requirements established in TIA-4953 were engineered based on the needs of people with hearing loss, so a telephone meeting this standard should provide the best possible sound output to optimize the intelligibility of speech," said AST President James Bress. "We look forward to testing many more telephones that address the needs and concerns of people with hearing loss."